A devilishly dark book with fantasy aspects and an incredible plot to keep you engaged throughout? 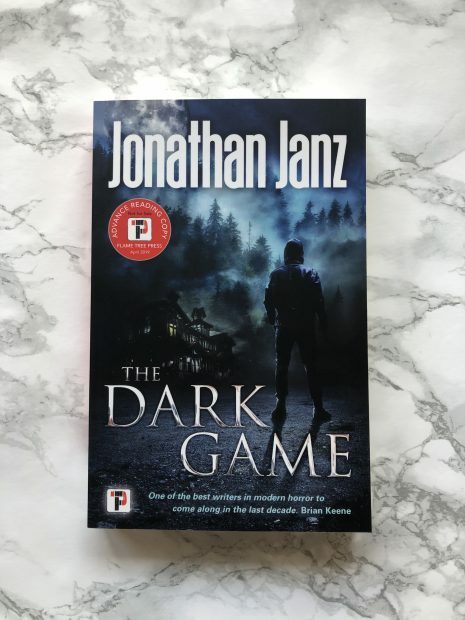 The Dark Game by Jonathan Janz is not to be missed. Ten writers are selected for a summer-long writing retreat with the most celebrated author in the world. Their host is the legendary Roderick Wells. Handsome, enigmatic, and talented, Wells promises to teach his pupils about writing, about magic, about the untapped potential that each of them possesses. The writers think they are signing up for a chance at riches and literary prestige. But they are really entering the twisted imagination of a deranged genius, a lethal contest putting them against one another in a struggle for their sanity and their lives. They have entered into Roderick Well’s The Dark Game. The synopsis for this book set my expectations preeetttyyy high, and I must say that I am not disappointed in the slightest. I wasn’t expecting any fantasy elements, but I’m not mad, as they actually fit really well into the story. I often find the horror genre difficult to write about, as what some may find scary, others don’t. However, there is so much horror going on in this book, that I’m confident you’ll be scared/grossed out at one point. If, like me, you have a vivid imagination, prepare to be scared/grossed out all the time. I found it so easy to be dragged into this story; the writing is spectacular, and I soaked up every last word. There were moments with lots of description, but then paired with long conversations to keep those pages turning. Now, I haven’t read many Stephen King books, because the length of them just really puts me off, but from the books I have read, I’d like to say that I think Janz is giving him a run for his money with The Dark Game. There are moments which made me very uneasy and made my skin crawl, and I’m pretty sure I thought I was going to die from heart palpitations at one point. The story itself was faultless – there was so many different layers, it definitely warrants a re-read soon to pick it apart. It could be hard to follow at times, but this is just because of the detail that has gone into it. I can’t fathom how much planning has gone into The Dark Game; such a unique idea and brilliantly done. I’d love to say that this book is a page-turner, and it is, but there were a few times I slowly (and I mean sloth-movements slowly) turned the pages because I was too scared to see what was going to happen next. My only disagreement, and it’s not affecting my five-star rating, but time wasn’t a huge focus in the book. We know the characters are there for the summer, but other than one sentence near the end, we don’t really get a timescale. I yearned to know how quickly this was happening, and to see when parts overlapped. This book, from my point of view, is totally messed up. Did I love it? YEP. Am I going to buy more of Janz’s books? BIG YEP.